Darnell Moore, author of "No Ashes in the Fire." In a word, Darnell L. Moore's compelling memoir No Ashes in the Fire is vulnerable. 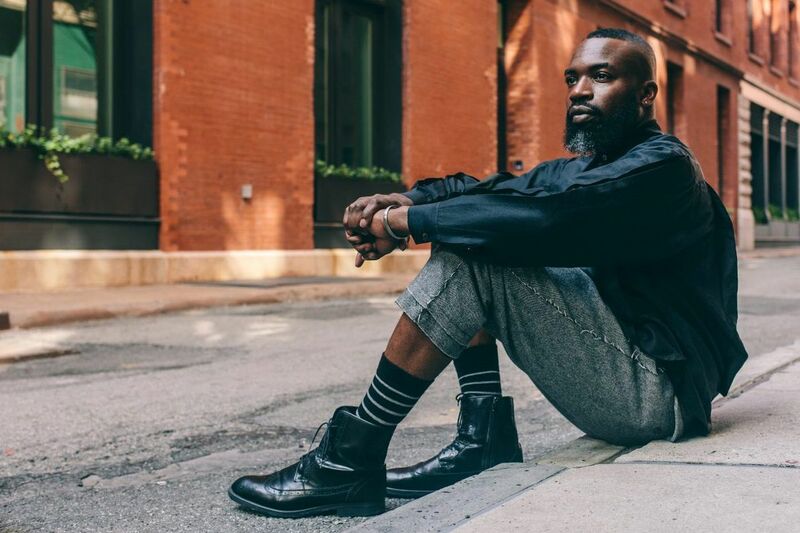 An activist and journalist, Moore takes readers through the glorious and traumatic experiences of his self-discovery as a young queer man growing up in Camden and Philadelphia. "I wanted to write a book that would be in the hands of a young person," Moore, 42, says, "a younger version of me, someone who needs the words now that I needed when I was growing up and didn't have access to." He brings his book to Philadelphia this week with three appearances: 7 p.m. Thursday, June 7, at the People's Sanctuary, 5507 Germantown Ave.; 6 p.m., Friday, June 8, at the Penn Book Center, 130 S. 34th St.; and a noon appearance Saturday at St. Paul's Baptist Church, 1000 Wallace St. When did you feel the need to write this book? I had an idea for a book for maybe the last three or four years, and the book that's printed now wasn't the book that I intended to write. I knew I wanted to write a book about the lives of LGBTQ youth of color, but I thought it would be more shaped like a social science book, more theoretical. I'm happy how it turned out. You take readers through your family history, dating back to 1877. You write, "Stumbling through the present unaware of the people and circumstances from which I came was like walking in the dark." What was the process of uncovering your past? I did a lot of research. I talked to family members. I combed the internet looking for birth certificates and death certificates and voter registration cards and military registration cards. I come from a family where histories are passed orally, but we also don't talk a lot about our past. I have a great-grandmother that pretty much taught herself to read while working overwhelming hours in dire conditions. So the light came by understanding who my people were and the strength they called upon to create a life that I can live and be here today. You bring up the Inquirer's coverage of Camden, with headlines such as "Violence, delinquency flare among E. Camden students," and articles such as one on Horacio Jimenez, who was described as "a big man, especially for a Puerto Rican." Do you think anything has changed in the way the media cover these communities? I've been very vocal as a media-maker and as a journalist regarding the way that, even to this day, when it comes to reporting on black people's lives — our lived experiences, issues that we are impacted by — we still see biased coverage. From the headlines to the [types of stories] we choose to cover, whether that's the spectacular nature of black trauma or our refusal to cover the everyday sparks of resiliency and brilliance in our community. Now, do we have more voices that are pushing against that? Yes. But when you think about [the lack of] black senior editors or above in their organization, we have a lot of work to do. When I would read the Philadelphia Inquirer and the Courier-Post, what was reported about Camden often read as a deficit analysis. Black and Latinx folks were portrayed as the people responsible for the shaping of Camden, as if there wasn't a long history of political neglect, political malfeasance, white flight, racial supremacy, and so much else. You have come close to death repeatedly. In your book, you describe being nearly set on fire, having a heart attack, and attempting suicide. How have those moments changed you? I've been shaped by my trauma. I didn't want to spectacularize that, but I wanted to point out how common those types of incidents can be in the lives of those who exist on the edge of the margin. I've also been reshaped by the love that was present in those moments, too. You write that queerness is a "way of life people fear because in it they might find freedom." Why do people fear that way of life? There's something about becoming comfortable in the cages that have been built for us, whether that's a rigid understanding of masculinity/manhood, or a rigid understanding of sexuality. For many of us, those socially constructed ideas are also cages. You know what happens when we spend a long time in those cages? We get comfortable. There's a fear of what can happen once you leave the cage and defy the norm. There's a fear of what's on the other side when you decide to embrace your whole self. I trust my mom and my family. I trust black people. I believe that black people are so easily disposed of in this country, [especially] those of us that do wrong. I believe to love radically is to figure out how we [prevent doing] to each other what the system has done to us, and I put my faith in that. Darnell L. Moore: "No Ashes in the Fire"
7 p.m., Thursday, June 7, People's Sanctuary, 5507 Germantown Ave. Free with RSVP. 6 p.m., Friday, June 8, Penn Book Center, 130 S. 34th Street. Free. Noon, Saturday, June 9, at St. Paul's Baptist Church, 1000 Wallace St. Free.